Each week, I have been enjoying the Yarn Along that Ginny at Small Things hosts. I have been truly inspired by all of the projects and have received a lot of wonderful book recommendations, too. 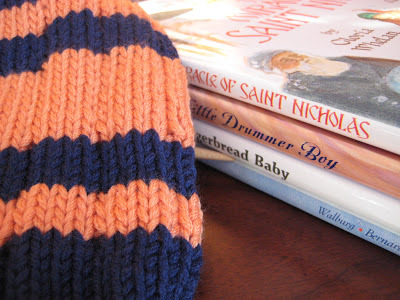 This week, I am finishing up a hat for my 3yo son, which I found on Ravelry. I used up yarn from my daughter’s twirly skirt, which I still haven’t sewn together (ugh). I was going to make the hat blue, orange and yellow, but my son told me he doesn’t like yellow. So, it is just blue and orange =) The one thing I am uncertain of about this pattern is the purl decreases. The pattern says to purl two together through the back, but I tried that, and I didn’t like it. (Maybe I was doing it incorrectly?) The pattern also says you can do a regular p2tog, so I did that, but I am still unsure. Fretting about my hand-knit hat being “just so,” I then read a little quote from my Advent book Joyous Expectation. To give some context, the chapter is talking about how the busyness of the Advent season can make us feel like the backside of woven fabric. So many things we “should” do, it can appear to be a tangled-up mess-of-a-time. But through prayer, we can turn the tangled mess over, and the true masterpiece of the season will be revealed to us. An intentional flaw! Because only God is perfect! Oh, did I need to read that! This quote helped me let go of the desire to knit the perfect hat. Does it really matter if the purls are right or wrong? What matters is that I made this hat for my son, and he will like it and won’t even know of its imperfections. It is a gift, and no gift—but Jesus—is perfect. The books in the photo are a few of our seasonal favorites: The Miracle of Saint Nicolas, The Little Drummer Boy, Gingerbread Baby and The Legend of the Candy Cane. Cute hat! I bet your son will love it. You're so talented! Thank you for sharing the quote. A perfect reminder, indeed. Love it! I like the blue and orange, your son has good taste in colors! I love your quotes and the sharing of how it applied to your knitting and in a march large scheme, your life. I needed that today too, thank you! What a great quote! And I like the colors that you used for your sons hat 🙂 I hope you get a chance to share a photo of your completed twirly skirt when you are finished to. That sounds so neat 🙂 Have a lovely day! Love the hat!! Technically, all my knitting has some sort of flaw, intentional or not 😉 Have a great week! Such a sweet hat. I like the quote because I struggle with wanting everything perfect and you remind me that it isn't a realistic expectation… that only our Lord is perfect. I want to do a color change hat like that. Cute hat. Great quote and or me Advent is such a blessed time of reflection. I really need to practice that more!! Those books all look wonderful (adult and childrens' alike!). Thanks for the recommendations. I love that quote! Glad I stopped by. I love blue and orange together–I did the purls through the front loops, too, and I think it turned out fine. I was thinking of that same concept of perfection as I was knitting this week, too. Thanks for sharing! I tell you, some of those stitches can be shockingly difficult! There was one I could not wrap my mind around. I watched some You Tube video about 3 thousand times before I could do it!